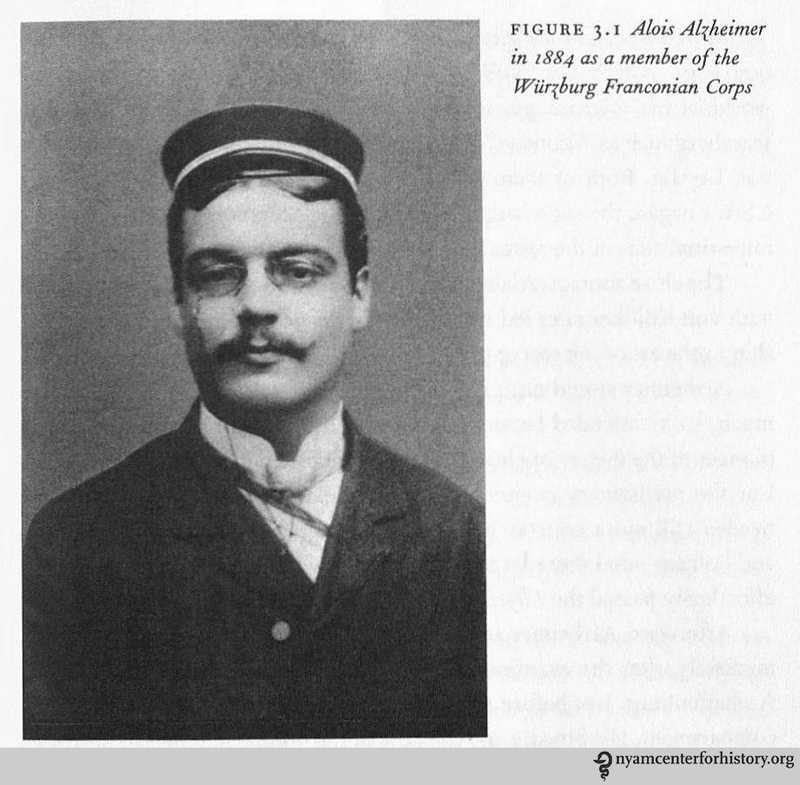 Alois Alzheimer in 1884. In Maurer, Maurer, and Levi, Alzheimer: The Life of a Physician and the Career of a Disease, 2003. Eminent German scientist Aloysius “Alois” Alzheimer was born on June 14, 1864. He considered himself a psychiatrist, because he “not only introduced the art of microscopy into psychiatry, but also contributed to psychiatry’s greatest interest in talking with patients.”1 His early work was at the Asylum for the Insane and Epileptic or “The Castle of the Insane,” where he spent hours listening to and examining patients, documenting each case.2 He also became a court-appointed forensic physician, treated private patients, and performed histological research. While at the Asylum for the Insane and Epileptic, he met Auguste D., a 51-year-old wife and mother with symptoms of forgetfulness and jealously, whose husband could not take care of her anymore. Her case was curious because she was so young and had led a relatively healthy life. Senile dementia had been documented in patients in their 70s and 80s but none declined so rapidly as in Auguste D. in her last 4 years. 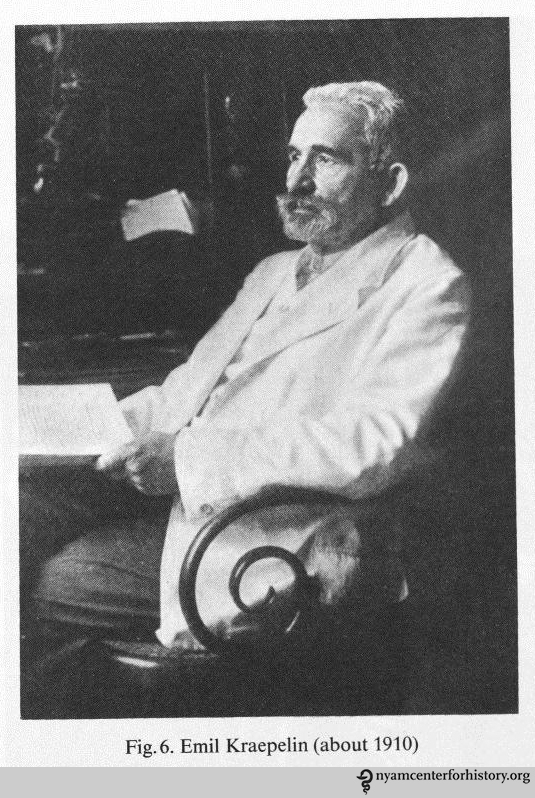 Emil Kraepelin circa 1910. In Kraepelin, Memoirs, 1987. Alzheimer resigned from the asylum in 1903 and began work at the Psychiatric Clinic on Nussbaumstrasse in Munich under pioneering psychiatrist Emil Kraepelin. Much of Alzheimer’s early work focused on dementia caused by syphilis. Working with Kraepelin, he delved much deeper into the presenile dementia he first noted with Auguste D. at the asylum, what was to become the pinnacle of his career. 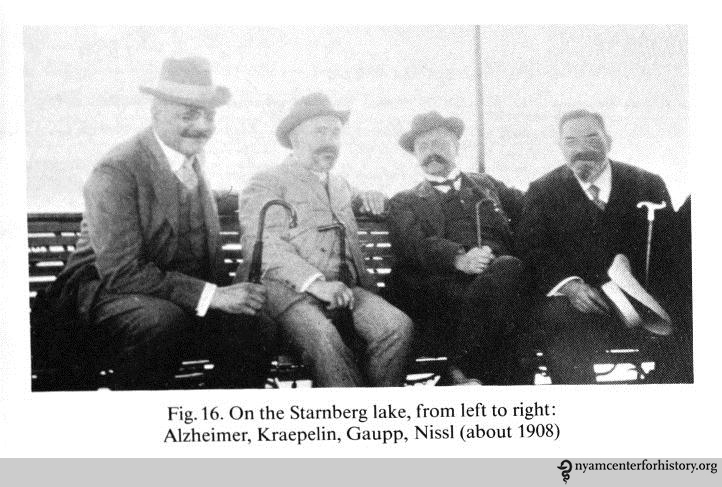 Left to right: Alzheimer and Kraepelin with psychiatrist Robert Gaupp and neuropathologist Franz Nissl, circa 1908. In Kraepelin, Memoirs, 1987. Drawings of histological preparations of Auguste D’s material, stained by Bielschowsky’s technique to demonstrate tangles, and their stages. Beginning of the disease. 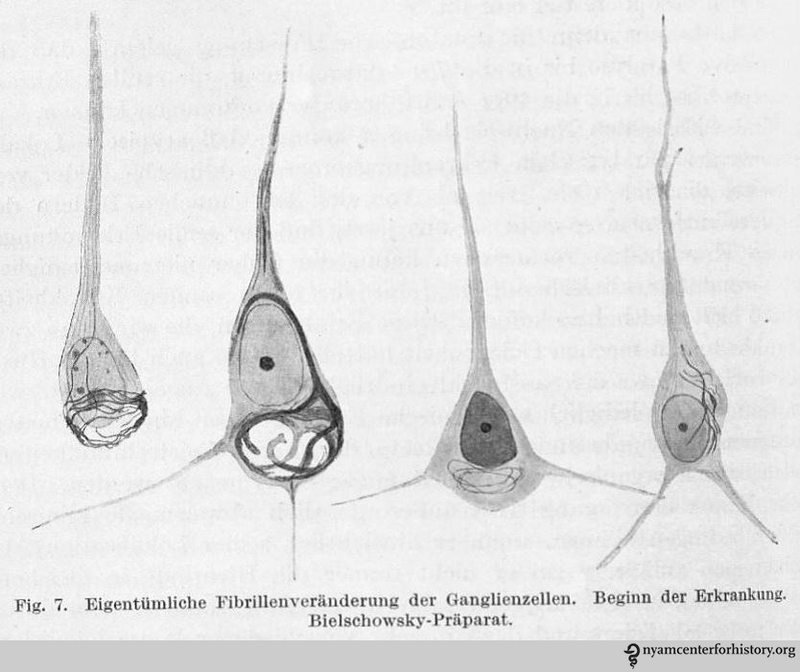 In Alzheimer, Ueber eigenartige Krankheitsfaelle des spaeteren Alters [On peculiar cases of disease at higher age]. Zeitschrift fuer die gesamte Neurologie und Psychiatrie 1911;4:356-385. 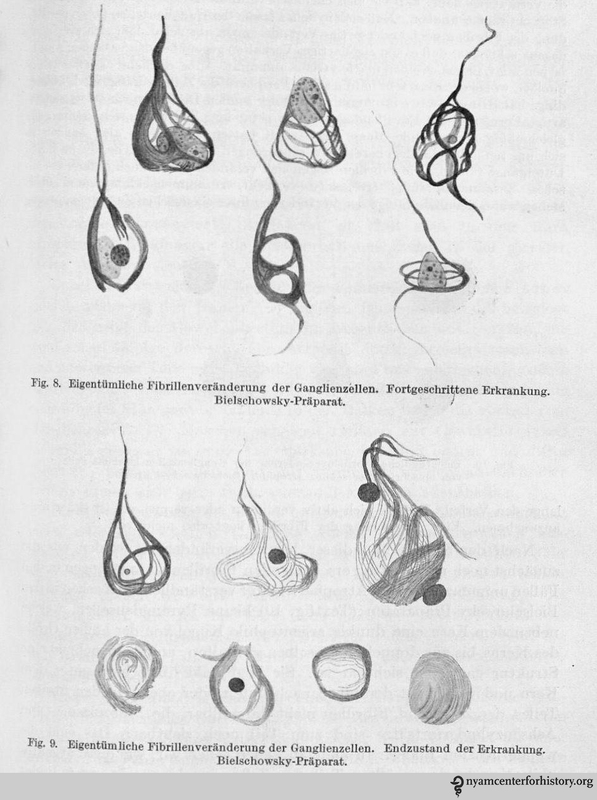 Drawings of histological preparations of Auguste D’s material, stained by Bielschowsky’s technique to demonstrate tangles, and their stages. 8. Advanced stage; and 9. Terminal state of the disease. In Alzheimer, Ueber eigenartige Krankheitsfaelle des spaeteren Alters [On peculiar cases of disease at higher age]. Zeitschrift fuer die gesamte Neurologie und Psychiatrie 1911;4:356-385. Click to enlarge. 1. Maurer K, Maurer U, Levi N (Trans.). Alzheimer: The Life of a Physician and the Career of a Disease. New York: Columbia University Press; 2003. 5. Hippius H, Neundörfer G. The discovery of Alzheimer’s disease. Dialogues in Clinical Neuroscience. 2003;5(1):101-108. 6. Zilka N, Novak M. The tangled story of Alois Alzheimer. Bratisl Lek Listy 2006;107(9-10):343-345. 7. Zilka N, Novak M. The tangled story of Alois Alzheimer. Bratisl Lek Listy 2006;107(9-10):343-345. This entry was posted in Collections, History of medicine and tagged Alois Alzheimer, Alzheimer's disease, anatomical doctrine, Auguste D., Emil Kraepeli, histology, neurofibrillary tangles by nyamhistorymed. Bookmark the permalink. Thanks for this brief, informative essay on Alzheimer and his contributions.